I Have Red Hair. What's My Season? Actually, that's not how it works! Don't pay too much attention to systems that try to tell you otherwise. Your hair color doesn't make a darn bit of difference in determining your season. A person with red hair might be found in any season, depending on her skin tone. And I personally know a redheaded True Summer. Redheads tend to have warm-toned skin, which puts them into Spring and Autumn categories. But it's theoretically possible that a person with genetically red hair could have Winter or Summer skin. ​Unsure of your season? Try at-home draping cards. Am I a Light Spring or True Spring? When considering the sub-seasons, it can often be difficult to identify colors that clearly distinguish between them. In the case of Light Spring vs. True (Warm) Spring, though, there are a few differences between the palettes that are relatively easy to articulate. If you've narrowed yourself down to these two seasons, you might use the following examples to help determine where you fit. Which colors can you (or can't you) wear? True Spring has no pinks to speak of. The closest it comes to pink is bright, fairly deep coral. Cameron Diaz is balanced in one of True Spring's saturated corals. Light Spring, on the other hand, has several lovely, warmish, light-to-medium pinks and pinky-corals. If you're a Light Spring, you may be able to wear a similar coral. But if you're a True Spring, you won't look well in that pink. Light Spring's lightest yellows are bright, but light and delicate. Scarlett Johansson is balanced by this very light, clear yellow. True Spring's yellows, even the lightest ones, are much more rich and buttery. Charlize glows (despite the too-dark eyes) in a characteristic True Spring yellow. I had to grey out the hair because its falseness distracted from the effect. A Light Spring may be able to wear both yellows. But the lightest, most delicate yellow will only flatter a Light Spring. True Spring's greens go surprisingly deep. Deeper even than this. Have I mentioned that this season can take a lot of color? You could imagine a green this deep on a Winter. True Spring can also balance this depth. Marcia Cross looks completely harmonious here. 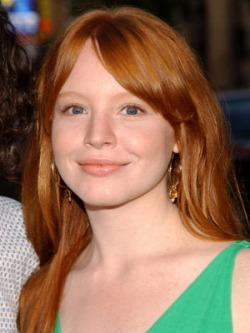 Lauren Ambrose's coloring is too delicate to take a deep true green, but this lighter green is lovely on her. A True Spring can wear a similar light green, but a Light Spring won't tolerate the deep, saturated green. True Spring can take a lot of contrast and a lot of depth. Light Spring can't -- they're overwhelmed. ...but Amy Adams pulls it off. Light Spring can go very, very delicate. True Spring can't -- they disappear. ... but perfect on Light Spring Taylor Swift. These women have two things in common. 1. They're all famous Springs. Young Charlize has brown hair. Her new growth in the 2nd picture is also brown. Young Nicole has warm brown hair with some natural highlight. Her new growth in the 2nd picture is also a warm brown. Young Scarlett has light brown hair with some natural highlights. Her new growth in the 2nd picture is also brown. Their Springiness may help these particular women be convincing blondes. But like most adult American women with blonde hair, their natural hair color is actually brown. I bring this up because we deceive ourselves about blondeness, and in doing so we deceive ourselves about seasonal color. We want to believe in blondeness. So we smile and nod when celebs claim they're "natural blondes" and we ignore the evidence in front of our eyes. Articles like this one perpetuate this peculiar, false faith in the supposed natural blondeness of brown-haired celebs. It doesn't take a lot of research to determine that Angelina, Brittany, Gwyneth, etc. have been natural brunettes at least since adolescence, if not longer. OK, so what? Why do I care? Well, partly because belief in the myth of widespread natural blondeness perpetuates an idealization of light coloring that's hurtful to darker women, especially because the context is a society that already privileges Whiteness in so many ways. Partly because of my nature: I'm an Enneagram 4. I want to reveal the truth. And partly - and most pertinently, for this blog - because seeing all these supposedly blonde Spring and Summer celebs leads us to incorrectly believe that Springs and Summers - especially Light Springs and Summers, and Warm Springs - are typically blonde. I personally know many brunettes whose path to discovering their true colors was made longer and more difficult because of a shared, mistaken belief that certain Spring and Summer seasons are blonde seasons. There is no blonde season. Every season's average or typical representative is a natural brunette. Statistically, it's inevitable that this be the case; with the vast majority of all human beings having naturally brown or black hair, a majority of even the most delicately-colored people will be brunette as well. It's true that natural blondeness is not found infrequently in the seasons with lighter palettes, in particular Light Summer and Light Spring. Might a quarter, or even a third, of adult Light Summers or Light Springs have blonde hair growing naturally from their heads? Perhaps. You can think of dozens of Light-season people as easily as I can. What proportion of them are blonde at age 30? Surely not the majority of them. Probably not even half of them. Let's revise our mental image of what these seasons look like. The caricatures just get in the way of seeing what's real. We know it's not about hair color anyway, so let's picture what it's really about. Look at the Light and Warm Springs and Light Summers that you know: what do you really see? Light Spring Scarlett's natural hair color now might resemble this. It's probably not this warm, but Warm Spring Cameron Diaz's natural shade may be about this deep. This color may be similar to Warm Spring Charlize's natural color. Light Summer Reese as a teen. This could be close to Michelle Pfeiffer's natural color. P.S. Blonde sisters, I hope it doesn't sound like I'm hating on you. You're beautiful and I love you. I just like to keep it real. Here is a hair color scale I originally intended to use in the post above, to help make clear how I'm personally defining "blonde" and "brown." In the end, it felt pedantic to include it - but now I think the failure to attempt to define terms just added to the general chaos. So for the record, this graphic reflects how I was conceptualizing these hair colors when I wrote the post. For me, it was essentially a question of hue: more yellow than brown = blonde, more brown than yellow = brunette.